Blame it on the rain, but the four, gray years I spent in Seattle inspired lingering obsessions with vibrant rubber boots, authentic Russian banyas, and steaming bowls of Vietnamese pho. Granted, the weather here is not always conducive to piping hot soup, but with winter on its way, folks on James Island can now look forward to a convenient source of the classic noodle broth at Pho Saigon. 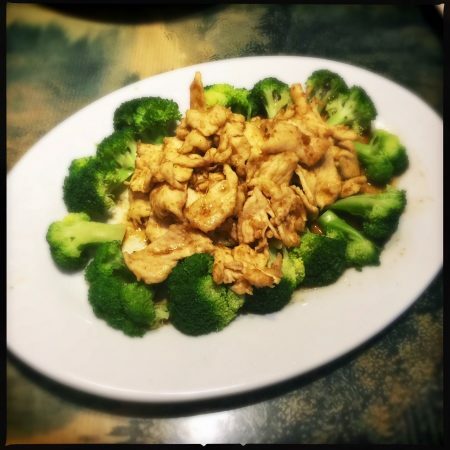 Set in a strip mall on Maybank Highway, the menu covers a wide swath of Vietnamese dishes. 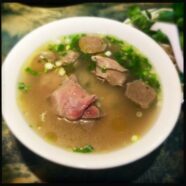 Starting with the obvious, the pho tai bo vien ($10.95) with meatballs and rare beef is everything you’d hope. The clear, brown broth is well-developed with discernible hints of star anise and cinnamon. Accompanied by the usual suspects of Thai basil, cilantro, and bean sprouts, as well as thinly sliced onion and fresh jalapeños, there are no real surprises here, but in the case of a classic, that’s a good thing. The friendly, enthusiastic waiter was teeming with ardent advice. Based on his direction, I also tried the bun dac biet ($11.95). Think deconstructed Vietnamese summer roll topped with chopped up bits of fried spring rolls on top. The plate is bifurcated with one side comprised of shredded iceberg lettuce and the other loaded with thin rice noodles topped with grilled pork, shrimp, and the aforementioned spring rolls. Simple and bland, don’t even think about taking a bite without adding some of the accompanying fish sauce. Voila, the salty, umami sauce adds a flavor bump, transforming what was just a yawn into a light, savory dish with interesting contrasts in temperature and texture. The same server’s direction toward the banh xeo ($8.95) was spot-on. 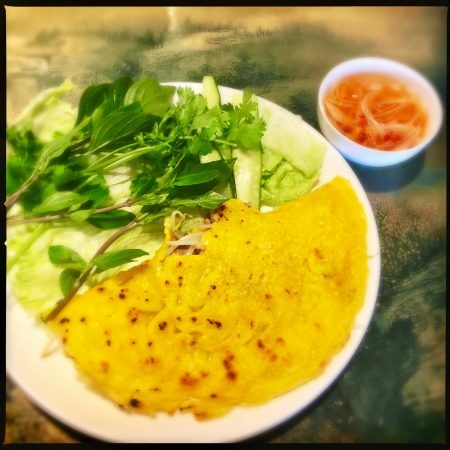 Not long after, the Vietnamese pan crepes were delivered by a shy, sweet woman who identified herself as the chef and then pantomimed the steps by which to eat the dish. The ‘crepe’ itself is savory and crispy, almost reminiscent of a fried corn tortilla. Filled with bean sprouts, sliced pork, and bay shrimp, the main event is accompanied by a second plate of greenery including cilantro, Thai basil, and cucumber slices, along with iceberg lettuce leaves. We were instructed to take the ingredients and make a lettuce wrap of sorts, then dip it into the sweet and spicy sauce, filled with sliced onion and shredded carrots. Fresh, crisp, and flavorful, this is a must-order item. 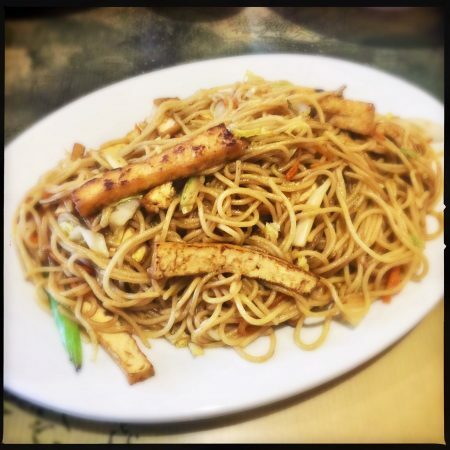 Also on point was the mi xao tau hu ($9.95), stir-fried rice noodles made with thin slices of firm tofu. Also featuring slivers of celery, carrot, and onion, it’s a simple, slightly oily plate with an admirable smoky wok flavor that rendered it one of the better items I tried. 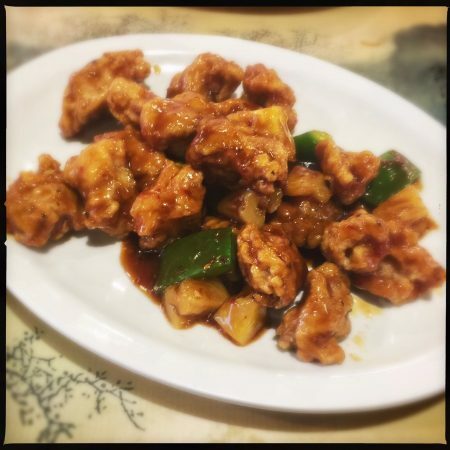 Despite the glowing praise heaped upon the General Tso’s Chicken ($10.95), in my experience, what was served to me is actually known as sweet and sour chicken. Made with pineapples, bell peppers, and a cloyingly sugary sauce, the poultry itself was quite dry, with a hard crust implying it may have been twice-fried. Not what I was expecting and not very good, things only took a turn for the worse with the steamed dumplings ($5.95). A bit too doughy, the six crescent-shaped potstickers were filled with a bland ground pork mixture and served with a sesame oil-heavy soy dipping sauce. Maybe it was just an off night, but this did not put me in anything approaching an Empire State of mind. 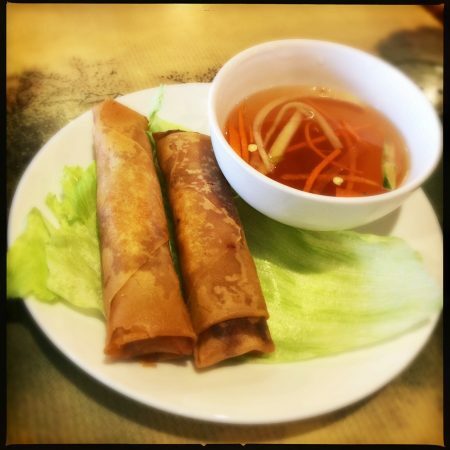 When one considers the authentic Vietnamese offerings brought to the table by the charming, humble chef, there’s a lot to like about Pho Saigon. It’s hard not to want such an earnest business owner to succeed, and in that vein, I would recommend a hasty divorce from the Chinese part of the equation. Or if nothing else, stick with the banh xeo or a steaming bowl of pho the next time it rains, and avert your eyes from the right side of the menu.